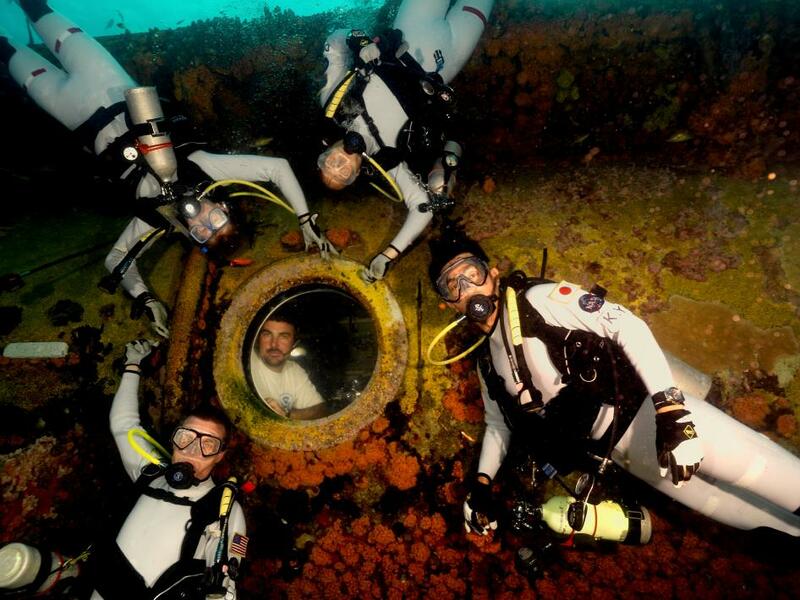 The NEEMO 16 crew gathered on the first day of the expedition (Credits: NASA). The 16th NEEMO expedition is currently taking place off the coast of Florida, where an underwater facility and crew are testing technologies and techniques that could be used in space on asteroid missions. On June 18, astronaut and aquanaut Stan Love gave the following account of his (short) trip in the DeepWorker submarine module. 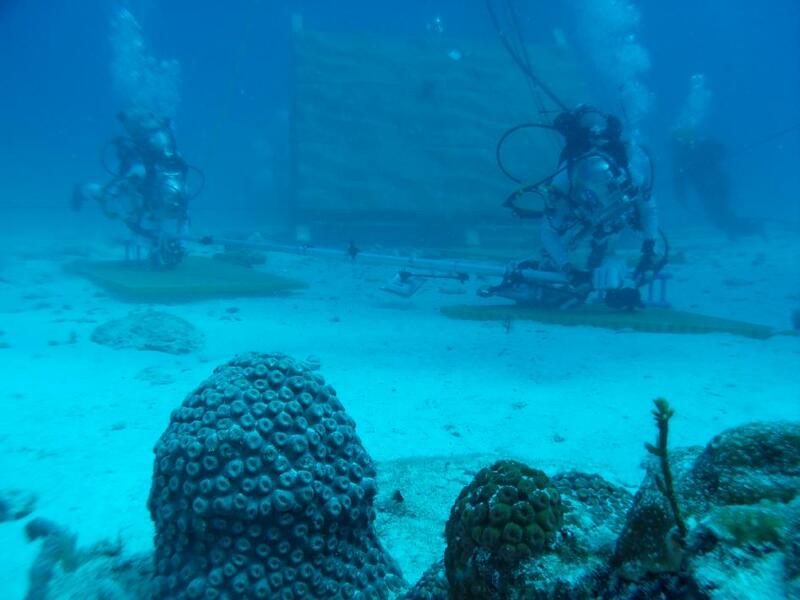 For the previous few days at NEEMO, the aquanaut crew has been moving around, taking geologic samples, and deploying science instruments as if they were astronauts in space suits exploring a near-Earth asteroid. The buoyancy of the sea water counteracts their body weight and makes them effectively weightless, as they would be near a small asteroid with very little gravitational pull. But it’s hard to work that way. With no place to stand, it can take a lot of effort just to keep your body stable, and any work you do with your hands is clumsy and inefficient. Astronaut/DeepWorker pilot Dr. Stan Love prepares for a communications check in the DeepWorker submersible (Credits: NASA). But now that NEEMO’s marine science dives are completed, the DeepWorker submersibles are available to work jointly with the aquanauts. The subs provide two tremendous advantages to our “spacewalkers”: mobility and stability. Instead of the aquanauts having to move from one place to another by going hand-over-hand along a rope, they can just ride along with the submarine. Instead of the aquanauts having to fight to keep their body stable with one hand while trying to do useful work with the other, they can clip their feet into a “foot restraint” attached to the front of the sub and have a solid place to stand, plus the freedom to work with both hands. 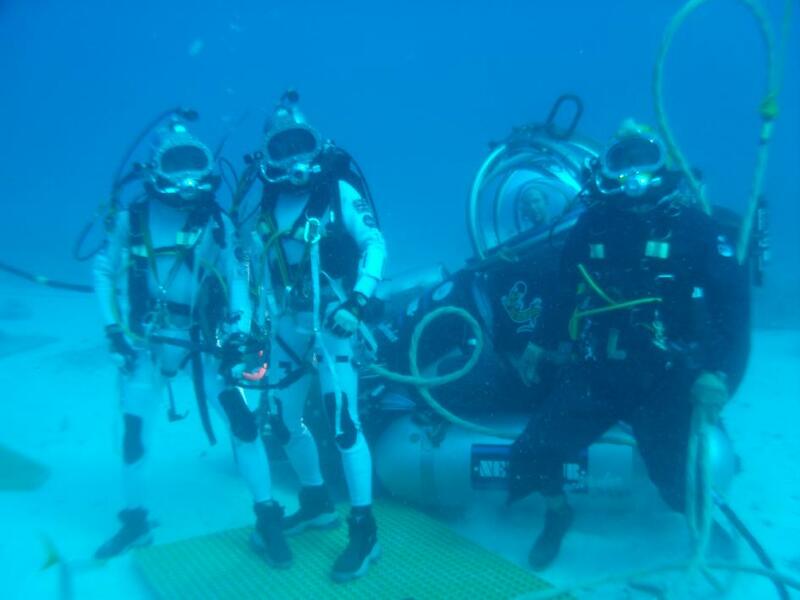 Part of our work at NEEMO this year is to quantitatively measure the time and effort it takes to do a wide variety of spacewalking tasks both with and without help from the subs. So Saturday morning, our first pair of sub pilots, Serena and Bill, got in the water and drove their vehicles down to a sand patch near Aquarius. Divers hooked communication lines to their sub so they could talk and listen on the same channels as the aquanauts. We had done some preliminary testing on the communication and it hadn’t gone well. But that day, to everyone’s immense delight, the communication worked perfectly! Serena and Bill did some test work with the aquanauts, and then returned to the surface. NEEMO 16 aquanauts Kimiya Yui and Tim Peake pose with their support diver and astronaut Mike Gernhardt in the DeepWorker single-person submarine (Credits: NASA). Mike Gernhardt and I were the sub pilots for the afternoon shift. 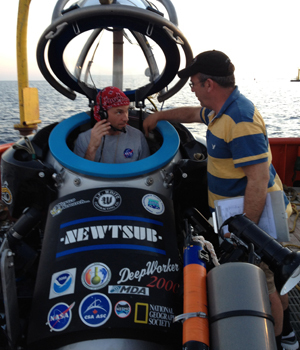 The plan was for Mike to do the first set of timed and scored tasks with the aquanauts while I observed and listened. But things did not turn out that way, as often happens in operations like NEEMO. Exploration is interesting in part because you do not know what you will find. And work in places like space, or the sea, is interesting because environmental conditions like space radiation, weather, or sea state can suddenly change the operation in ways that are hard to foresee. Out on Liberty Star, the large and beautiful ship that has come to support sub operations for the rest of the mission, my sub was the first to go in the water. The crane hoisted me off the deck and into the water and the lift hook disengaged. Immediately I heard the voice of Jeff Heaton, the dive supervisor, on the radio: “Engage thrusters and move away from the ship!” The next second, the sub cabin jolted hard and tilted sharply, and I found myself wedged beneath the ship’s fantail between the rudders and the propellers (which had been turned off during sub launching). I enabled the thrusters and gave full throttle in all directions but the sub did not budge. Under the water my VHF radio could not transmit or receive, and my location under the back of the ship was not accessible to the through-water communication system we use while the subs are working near the sea floor. So I was on my own. What had happened was that my sub had been immediately caught by a strong current and pinned against the ship. With no way to escape on thrusters, and the swell continuing to bang the sub against the hull, the only option was to do down. I flooded the sub’s soft ballast tank, which seemed to take rather a long time, and finally dropped down away from the very bad spot I’d been in. Once below the ship I got a partial transmission on the through-water comm telling me to descend to the bottom and hold there. This I did, putting in some forward thrust as well so that the current would not take me far from the ship. Aquanauts testing a transversing mechanism sans submarine (Credits:NASA). I reached bottom on mixed sand and coral in about 90 feet of water and stayed there. The comm was very bad. Occasionally a call would make it through, but I wasn’t hearing much and most of my transmissions went unanswered. I was able to tell Topside that I could see no damage to the sub and that my cabin atmosphere was safe. They responded with a recommendation to stay on bottom while they prepared to recover me. So I sat there and waited. I made test calls now and then, sometimes receiving an answer. The current strengthened even more and began to drag the sub along the bottom. I still didn’t want to drift away from the ship, so I maneuvered over to a rock and let the current hold me in place against it. Nuytco Research, the company that owns the subs, has worked out emergency procedures for sub pilots to carry out in case anything goes wrong on their flights. One of those cases is a loss of communication. For most dives, the instruction for the pilot is to start a clock the first time an expected call is missed, and if an hour passes with no communication they should bring the sub back to the surface. For our operation, since we were always going to be near the ship and in shallow water and since communication was central to our job, we had agreed on a limit of 15 minutes. I nearly got through a couple of 15-minute intervals, but then a partial call would make it through and I reset the clock. While waiting I watched the fish moving around the sub. A spotted eagle ray, black with vivid white spots, swam by. I got out my camera and took a few pictures. Finally the communication with the ship stopped entirely. I waited another 15 minutes, then got on the thrusters. The current was still strong enough to make it hard to disengage from the rock I was next to. But the sub did come free, and I drove it away from the bottom. I kept an upward eye to make darn sure I didn’t come up under the ship! I needn’t have worried. The sub surfaced about fifty yards from the Liberty Star. Immediately Jeff came over the VHF radio and guided me back to the crane hook. Recovery was swift and efficient, and soon I was back on deck enjoying the breeze and asking whether I’d made the right decisions. Everyone assured me that I had, and Jeff commended me on having actually read and followed the lost-comm procedure. Evidently not everyone does that. He also said that from their perspective, they had put me in the water and I had disappeared instantly. I’m glad I wasn’t the only one who felt that way! While Jeff and I were chatting, Mike from Nuytco came up and handed me a stubby, heavy, black plastic cylinder with a big blue-smeared bite taken off the edge of it. “Here’s your through-water comm transducer. Do you want to keep it?” Yes, I did. I will take it home and put it in my curio cabinet as a memento of an exciting day in the submarine. That ‘ducer sits high on the back of the sub, behind the pilot’s head, and it acts as the “antenna” for the system. If it’s broken, no communication occurs. The blue color was bottom paint from the Liberty Star. Evidently the ‘ducer had taken the brunt of my impact with the ship. That explained the bad communication. After that, the rest of the day was kind of anticlimactic. The Nuytco crew quickly installed a new through-water comm ‘ducer on my sub and made sure it was fit for duty. I drank a bottle of Gatorade to replace the fluid I’d lost from sweat (both from temperature and stress, no doubt), then hopped back in the cockpit to do our now-badly-delayed mission to the habitat, this time with both subs and no mishaps. We returned to shore at dusk, with take-out dinner plates kindly provided by the Liberty Star’s excellent cook. Another day thoroughly seized.